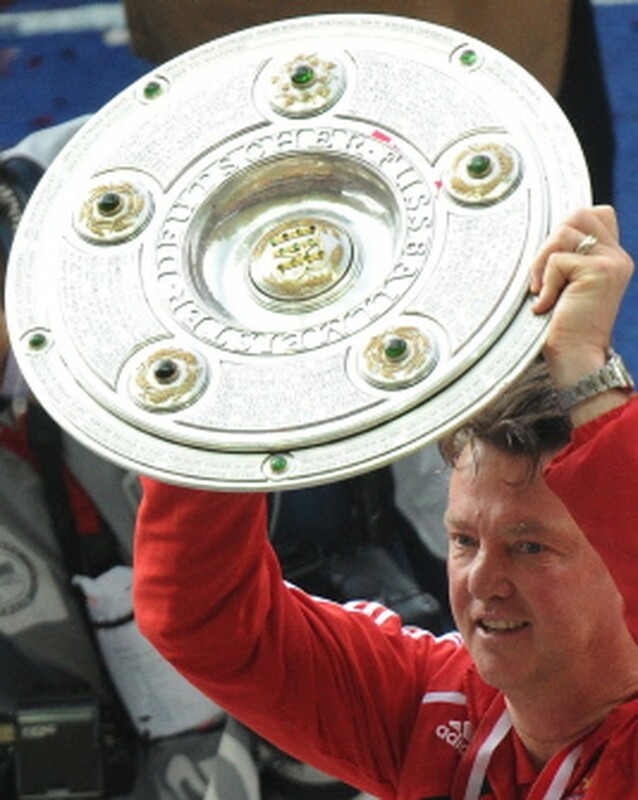 BERLIN, May 8, 2010 (AFP) - Bayern Munich coach Louis van Gaal rounded off a Harry Houdiniesque escape act here on Saturday as he guided Bayern Munich to their 22nd-German league title just months after he was staring at the sack. The combative Dutchman has once again shown his extraordinary powers of resilience in the face of adversity as having come under extreme pressure following an underwhelming start to the campaign Bayern have conquered all in Germany. Indeed they are facing the prospect of finishing the season with three trophies, with aside from the Bundesliga title, possibilities of landing both the Champions League and German Cup. His equally obdurate compatriot Mark van Bommel lifted the Bundesliga shield at Berlin's Olympic Stadium on Saturday, something which looked a long way off back in November. By mid-November, Bayern were on the brink of exiting the Champions League after two defeats to Bordeaux, and were seventh in the Bundesliga, six points off leaders Leverkusen after 13 matches. But the team was top of the league by late February and have not looked back since leaving van Gaal on such a high that he admitted he will be a 'party animal' after his side won the Bundesliga title. The turning point was the trip to Turin in December where even without superstars Franck Ribery and Arjen Robben, Bayern beat Juventus to qualify for the Champions League's knockout stages. Van Gaal is no respecter of reputations and showed it by quickly shaking up any Bayern stars who had got too comfortable. After the club sacked coach Jurgen Klinsmann in April 2009, van Gaal took over at the Munich helm on July 1. "We are who we are! And I am who I am: confident, arrogant, dominant and honest, a workaholic, innovative, but also warm and family-friendly. That’s why I think I’ll fit in," he said on his arrival. The Dutchman was not to everyone's taste - Italian striker Luca Toni soon fell out with the disciplinarian while Ribery had a spat with the coach before peace was declared. Fresh from leading AZ Alkmaar to the Dutch title, van Gaal said from the outset that building the side the way he wanted it could take two years and he warned the first few months of his reign could be problematic. Sure enough, Bayern failed to win their first three league fixtures, but the arrival of Robben from Real Madrid in August was a masterstroke. The former Chelsea star announced his arrival with two second-half goals against defending champions Wolfsburg having come off the bench. The victory came after Bayern's shock 2-1 defeat at Mainz and was Bayern's first win under van Gaal which was followed up by a 5-1 drubbing of Dortmund away from home. Munich lost again when Hamburg floored them 1-0 at the start of September as the mutterings of discontent about van Gaal grew as winter approached. Back-to-back wins over Frankfurt did little to appease the rumblings as Bordeaux beat Bayern home and away in the Champions League. But Bayern's 2-0 defeat at home to Bordeaux on November 3 was to be their last in any competition until they were beaten at Fiorentina on March 9. League defeats by both Stuttgart and Frankfurt proved to be no more than small ink blots on the copy book as van Gaal's side wrote a fresh page in the club's history in April. The quarter-final home win over Manchester United at the end of March will go down in Bayern folklore while their 3-2 defeat at Old Trafford was enough to put them in the semi-finals when they beat Lyon over both legs. By now van Gaal had settled on his preferred strike force of striker Ivica Olic being supplied by Robben and Bastian Schweinsteiger as Ribery struggled with injuries for much of the season. Just when the Frenchman returned from a persistent knee problem, he was quickly engulfed by an under-age call-girl scandal which rocked the France football team. Bayern effectively earned their 22nd German league title with a 3-0 win over Bochum as a Thomas Mueller hat-trick left them three points clear of second-placed Schalke with a vastly superior goal difference. "We’ve made huge leaps forward in the last six months," admitted German fullback Philipp Lahm, who has always called for patience in judging Van Gaal. "He’s an excellent coach, and it was only a matter of time before he tasted success here."